The cheese of western Switzerland, with a delicate, distinguished flavour. Made since at least AD 1115 in and around the small town of Gruyères, today it is still produced by village cheese dairies in western Switzerland according to the traditional recipe. The Gruyère AOP owes its characteristic delicacy and flavour to the top quality raw milk produced by cows fed on grass in the summer and hay in winter, coupled with the skill of the master cheesemakers. No less than 400 litres of fresh milk is needed to produce a single wheel weighing around 35kg. During the slow maturation process, which takes several months in special cheese cellars, the wheels are regularly turned and rubbed down with salty water. The maturing process lasts between five and 18 months. The humidity and rind washing process develop the characteristic appearance of the cheese and assists in bringing the cheese into full maturity. This is what gives Le Gruyère AOP its famous, distinct flavour. It’s no great surprise that this authentic gift of nature is appreciated by cheese lovers throughout the world. Each cheese is systematically identified by the number of the mould and code of the cheese dairy. The day and month of production are also noted on the wheel. These black markings are made with casein, the cheese protein. No artificial additives are involved here either. From this time on, the name «Gruyère AOP» and the code of the production facility appears on the heel of each wheel of Gruyère AOP as an effective way of preventing fakes and guaranteeing authenticity. This technique employs branding irons, which give an indentation in the wheel. It is this marking that makes it possible to identify and trace each individual cheese. 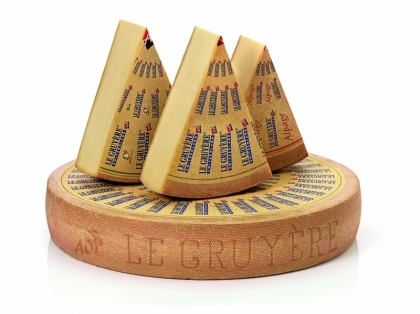 Le Gruyère AOP takes pride of place on any cheese platter. It makes for a delicious dessert and can be used in tasty warm dishes. What’s more, no real fondue would be complete without genuine Gruyère AOP.